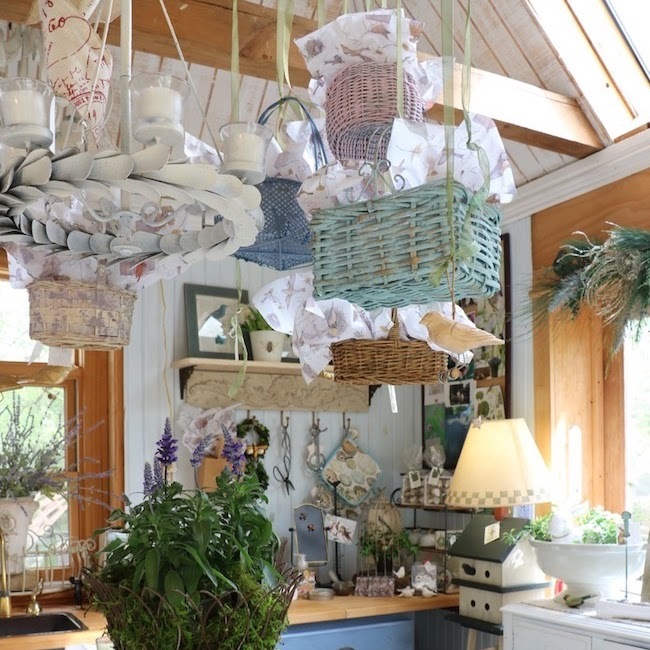 Part of the joy of decorating is using something new or adding a twist to something old. Introducing a flair that makes the arrangement your own creates your home like no one else's. The ruffled kale is the little twist that makes bedding a white pumpkin in an urn fresh and unexpected. Ideas for other bedding bases for a pumpkin are boxwood wreaths, grapevine wreaths, white baby's breath, and wild angel vine. Why did I choose ruffled ornamental kale for decorating the living room this Fall? As much as I love white, I also love periwinkle blue which is the one unifying color throughout my entire house. 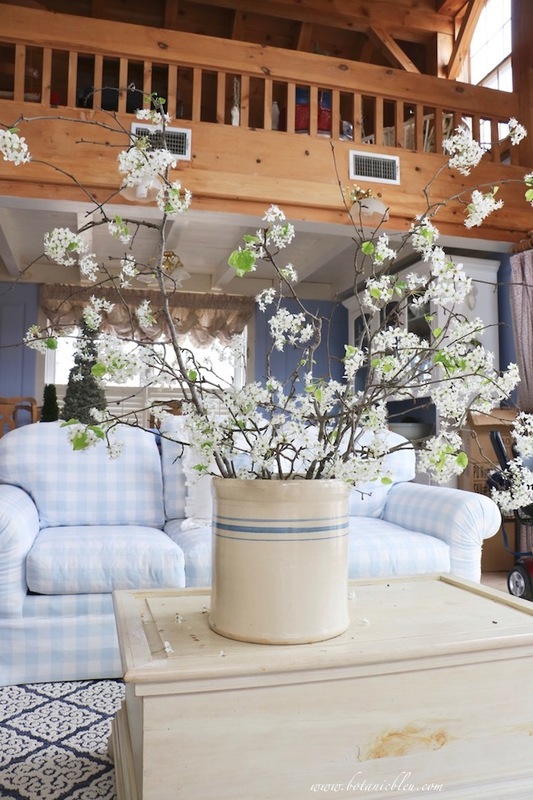 When it comes time to decorate for any season I always look for colors that go with my everyday look, blue and white. 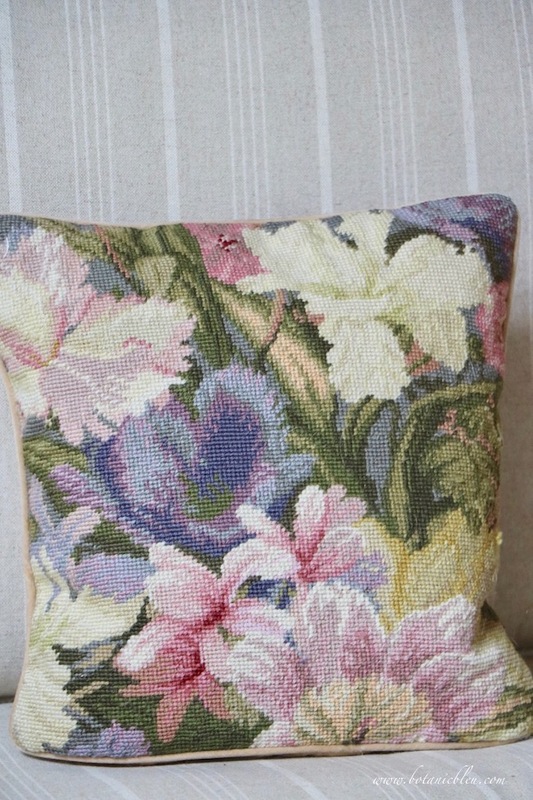 For this Fall, I used the colors in this needlepoint pillow as my inspiration. The purple and green of ornamental kale are predominant colors in the pillow. 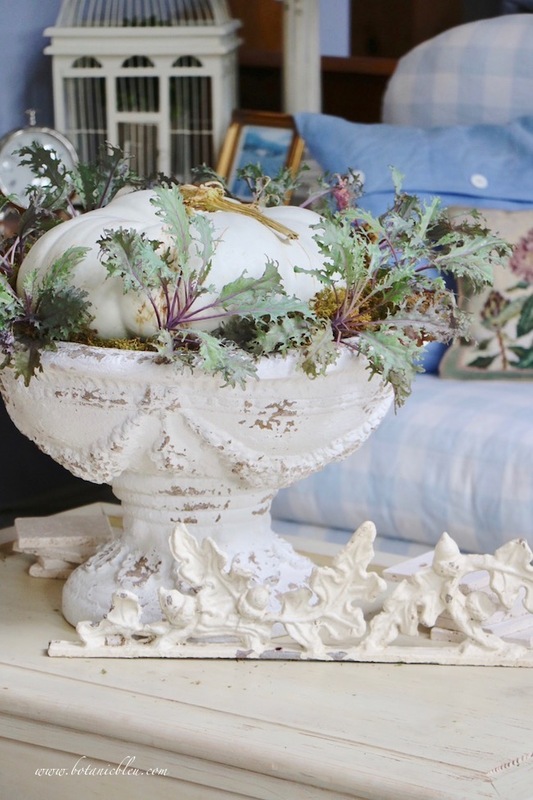 The large French-style urn with pumpkin and kale, a white chrysanthemum, and a large purple ornamental kale are the only new things added to my French-inspired living room, but are all that is needed to add Fall decor. ❶ The large white pumpkin nestled in small ruffled ornamental kale bedding plants is now on the concrete bench in the entry garden leading to the front door. 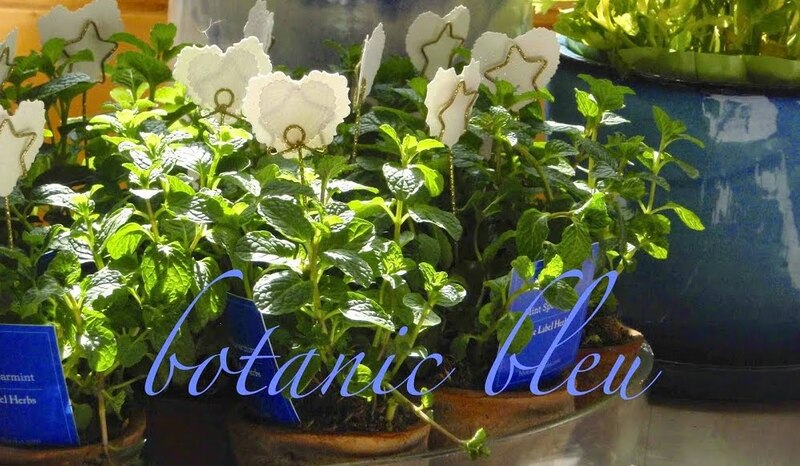 ❷ The ruffled bedding plants now fill a large low container on the front porch where they will continue to grow during the winter. ❸ The large purple kale was in the kitchen on the shelf behind the sink before coming to the living room for a few days. Now it is outside on the front steps. 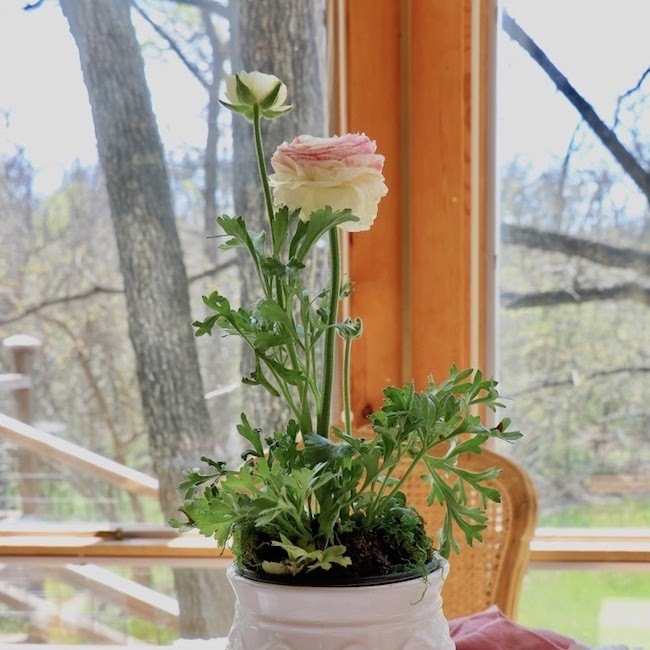 ❹ The white chrysanthemum is in a French urn beside the concrete bench in the entry garden where it will remain fresh for a longer period this Fall. See beautiful Fall display tips for more photos of Fall arrangements from years past and with ideas for how to create them. 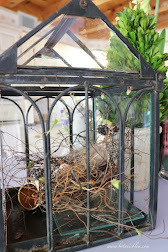 I love decorating and sharing details with my readers for how to recreate similar arrangements in your own homes. Thanks for visiting my French-inspired Fall living room. Ready for more Texas-style Fall inspiration? 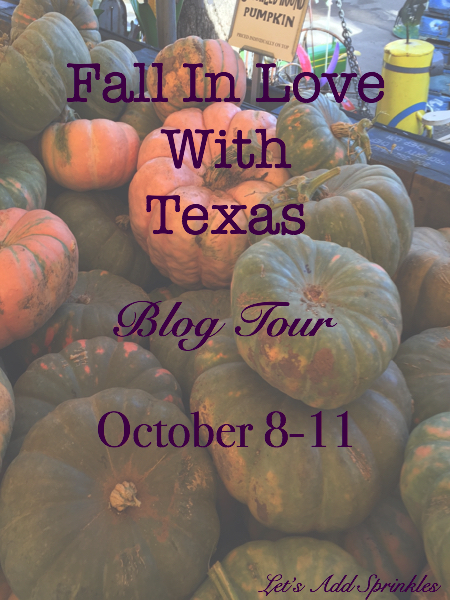 See the full schedule for the Fall In Love With Texas blog tour below. Tell everyone I said, "Howdy." I love the addition of ornamental kale to nestle underneath pumpkins. 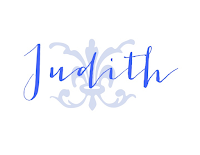 This is truly so cute and clever Judith! Your home is so soothing and calm, and styled with such class, Judith. Thank you for all the tips and inspiration on this tour. 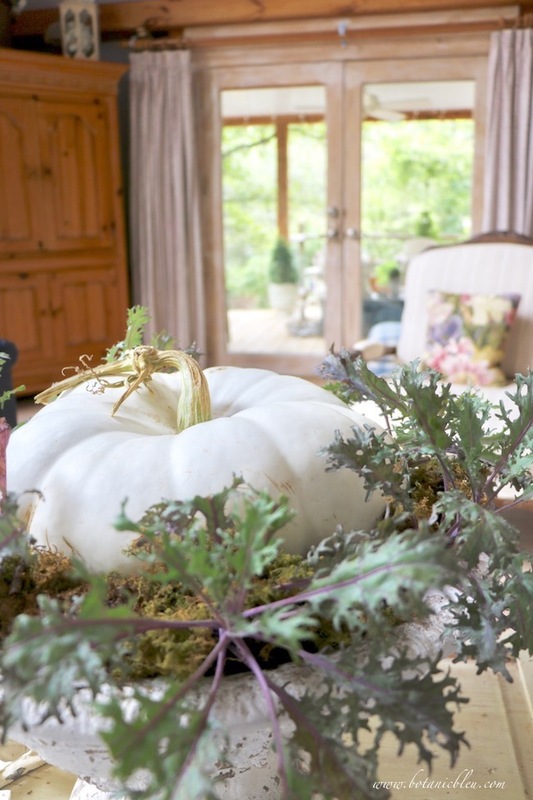 That urn is beautiful by itself, but gorgeous with the pumpkin and kale. Pinning for when I find the right urn. It's just lovely. I love kale for fall and winter. Your home is stunning with the light filtering in. 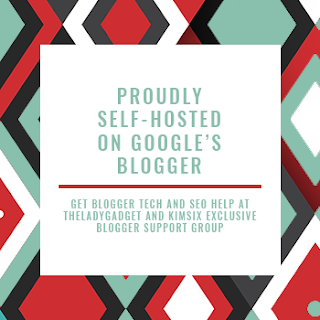 Thanks for linking to our blog tour. 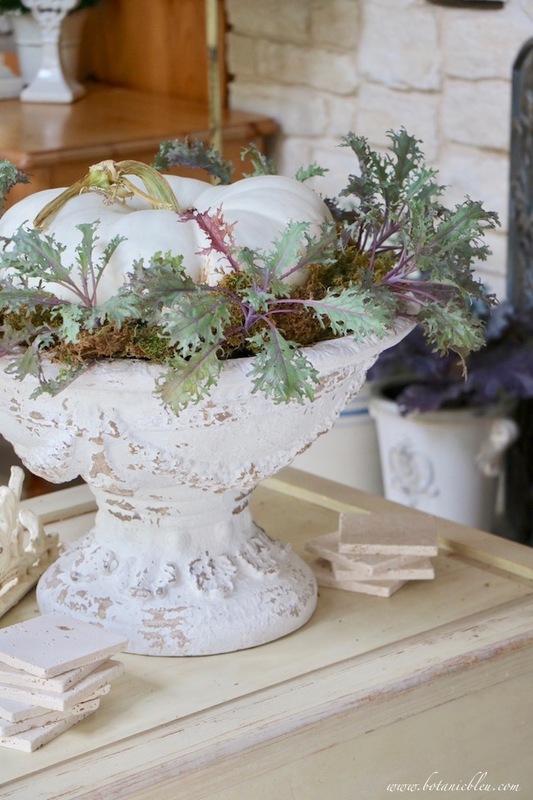 I love this....the urn, the kale, pumpkin...all so pretty. 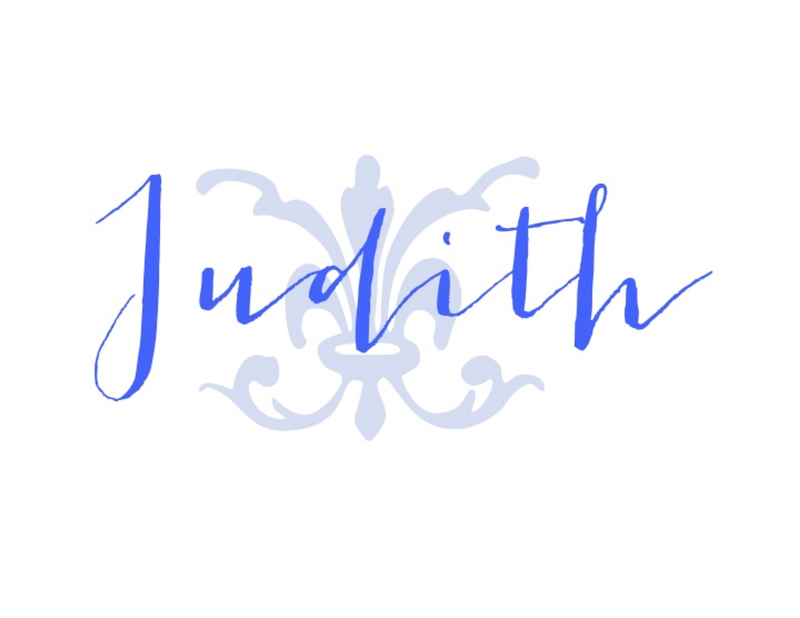 Just perfect, Judith! I like the ruffled kale. It not only gives a nod to your colors of the needlepoint pillow, but the texture is a fun contrast to the texture of the urn. 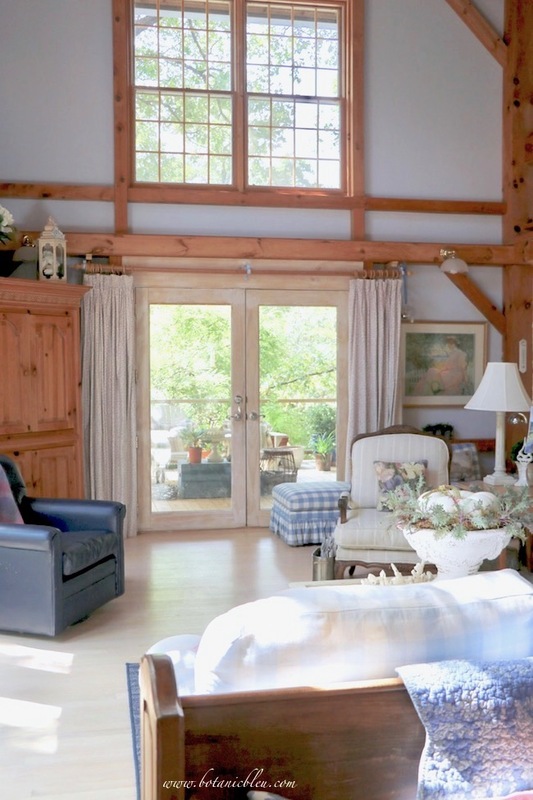 I love the open ness and light filled rooms of your home. Each time I see your photos, I think how special your home is. Enjoy these crisp fall temps that we are having now. Happy Fall! Judith- as always everything you do is lovely and elegant. Your tips are always spot on. 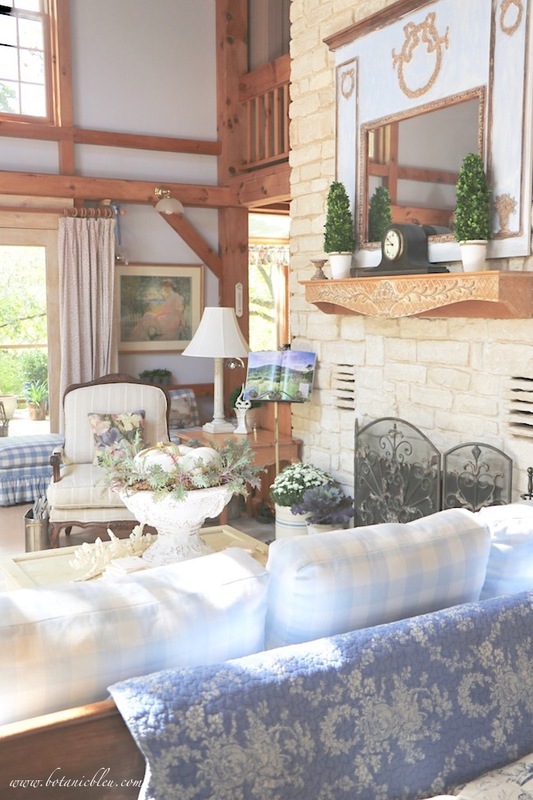 Lovely arrangement, and the sunlight in your living room is grand! 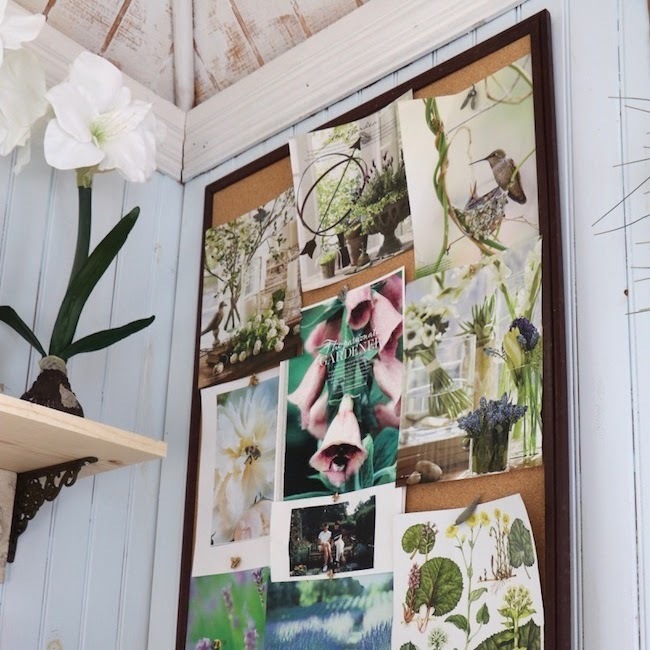 You have such a pretty room to decorate. The architectural elements are so striking! I love your living room, and the urn with the pumpkin is so pretty! I like the kale leaves in it, too! Judith, I think everything looks so pretty! I especially love that needle point pillow! Have a great weekend! What a beautiful tour! I love all the natural elements. Judith, your home is gorgeous. Really. You have a talent that needs to be more widely seen. Very pretty. The colors are so cool and calming. 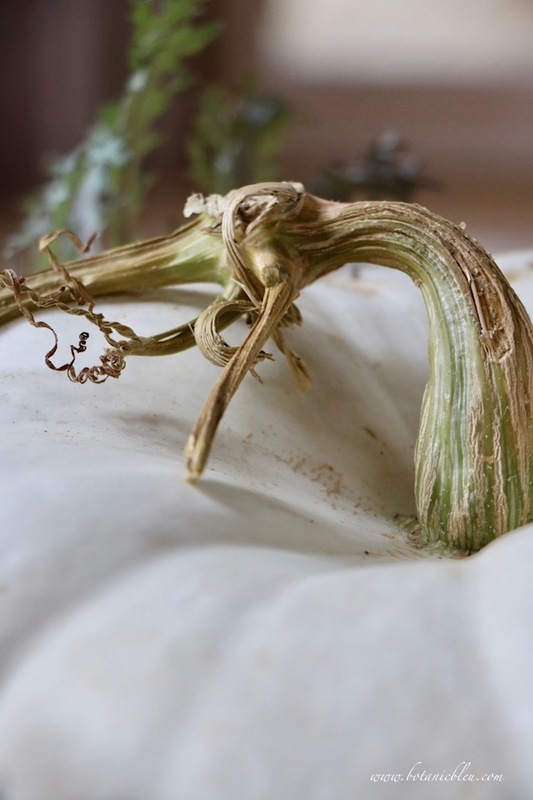 Love the white pumpkin in the marvelous urn. Perfect.